The Group of Complex Systems and Networks (COSNET) is a scientific Lab headed by Prof. Yamir Moreno and is part of the Institute for Bio-computation and Physics of Complex Systems (BIFI). During more than 10 years, the group has been working, among other research lines, on different problems related to the study of game theory and social dilemmas. In collaboration with other colleagues, we have been publishing several papers on the subject in an attempt to analyze and better understand the different patterns that have led to the emergence, prevalence, and evolution of cooperation in different scenarios. Cooperation is present all around us and it is the mechanism that has helped us to be what we really are today. Teamwork, specialization of labor and the emergence and evolution of language as a complex system of signs that ensures an effective communication between people, are fundamental keys that have allowed the transition from primitive societies to modern and industrialized ones. The study of cooperative phenomena in nature and in human society continues to generate a heated and profound debate among researchers from various fields. In the last decades, it has been written, advanced and hypothesized much on this topic. However, the underlying mechanisms and real motivations responsible for promoting or not human cooperation in specific contexts are still an unsolved conundrum. Certainly, trying to put together the pieces of this puzzle is not an easy task and only an interdisciplinary and rigorous view based on the validity of the scientific method will be able to shed more light in this field of research. As scientists, our main task is to work together and provide new insights and reliable approaches. Finally, history has witnessed that scientific advances are the result of cooperation and that science, itself, is a collective heritage. During our journey into the topic of Evolutionary Game Theory, we have also collaborated with other leading scientists in the field such as: Dr. Arne Traulsen, Director at the Max-Planck Institute for Evolutionary Biology in Plön, Germany, Prof. Matjaz Perc, Faculty of Natural Sciences and Mathematics, University of Maribor, Slovenia, with whom we have recently published a review on the subject (M. Perc et al., “Evolutionary dynamics of group interactions on structured populations – A review”, Journal of the Royal Society Interface 10, 20120997 (2013). PDF Version freely available here) and Prof. Angel Sánchez of the Department of Mathematics at the University Carlos III (UC3M) in Madrid. Both, Prof. Angel Sánchez and Prof. José Cuesta (also from UC3M) have an extensive experience in issues related to complex systems such as: game theory, statistical mechanics, nonlinear dynamics and several applications in biological, social and economic sciences. The idea of a ​​joint collaboration between BIFI scientists and researchers from UC3M for the design and running of large-scale experiments on human cooperation arises as a need to test several theoretical hypotheses behind some modeling approaches in the specialized literature. 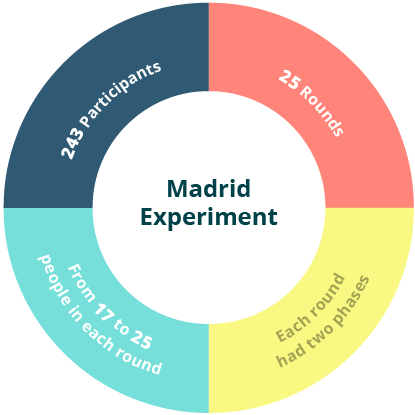 On December 20, 2011, the largest experiment that has been performed up to now involving humans playing a Prisoner’s dilemma game, took place in Zaragoza. More than 1200 students coming from 42 schools of the Autonomous Community of Aragon participated in an unprecedented real-time experiment. Even today, just a few experiments have been carried out on Prisoner’s Dilemma and, in the great majority of cases, they are restricted to only small populations (i.e., tens of participants). 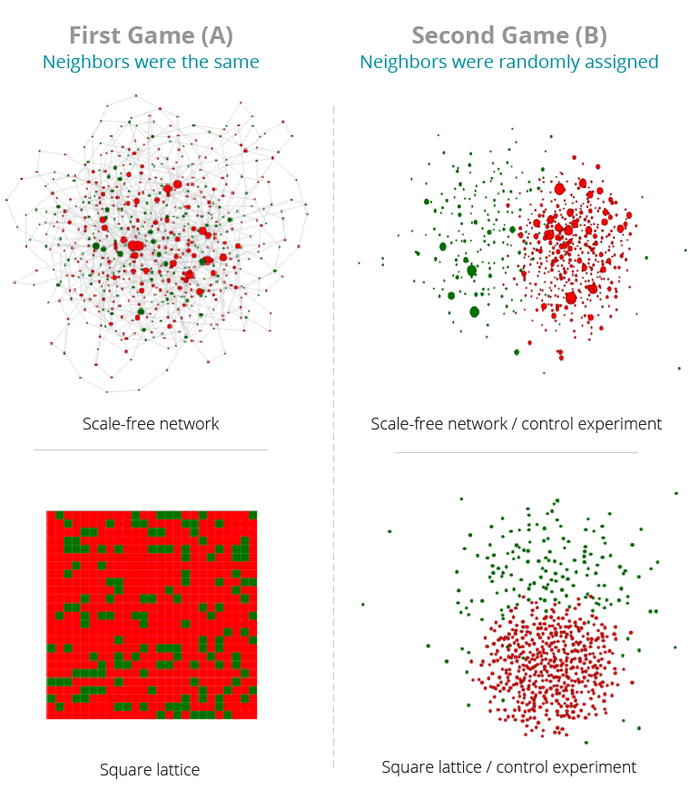 The Zaragoza experiment was performed using a regular grid of 25×25=625 people and also a heterogeneous network (scale-free network) were 604 subjects were arranged. In this kind of networks, few people are highly connected while most of the others are poorly connected. This type of structure has been found in many social organizations and therefore, it was extremely important for us at that time to determine how this kind of structure influences the emergence of cooperation. The conclusion: We didn’t find any evidence of network reciprocity. See our PNAS paper for more details: C. Gracia-Lazaro et al., “Heterogeneous networks do not promote cooperation when humans play a Prisoner’s Dilemma”, Proceedings of the National Academy of Sciences USA 109, 12922-12926 (2012). PDF Version . The experiment was run using a sophisticated Web application developed by BIFI researchers of the Computer Lab headed by Prof. Alfonso Tarancón. The software developers were: Gonzalo Ruiz Manzanares, Alfredo Ferrer & Cristina Viñas. The application was developed in Ruby On Rails, a technology used by different popular websites like Twitter. On the other hand, the tool used for database management and handling was MySQL, a freely available, flexible and robust open source relational database management system based on Structured Query Language (SQL). For the correct visualization of the experiment in real time, we created a map on OGRE (Opens source 3D Graphics Engine) that was projected on a giant screen. 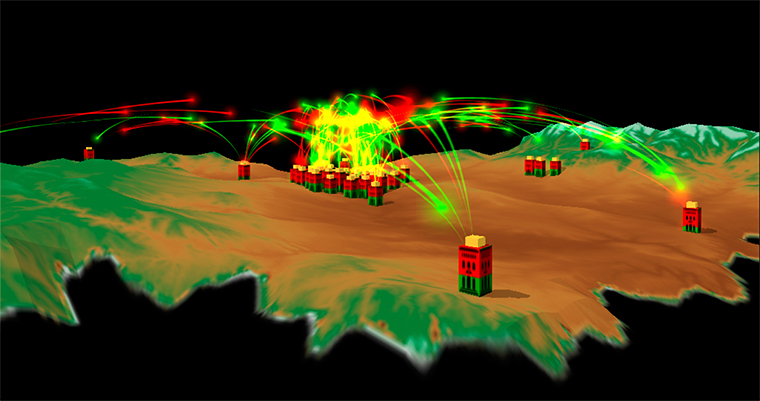 Snapshot of the visualization of the experiment, Copyright ©-BIFI. It is worth mentioning that in the Zaragoza’s experiment we have the support of Ibercivis Foundation (citizen science) in all aspects regarding organization and recruitment of participants. Subsequently, we (COSNET Lab/BIFI- UC3M team) conducted a second PD experiment in Barcelona in collaboration with M. Gutiérrez Roig and Josep Perelló, Assistant Professor at the Department of Fundamental Physics at the University of Barcelona (UB). 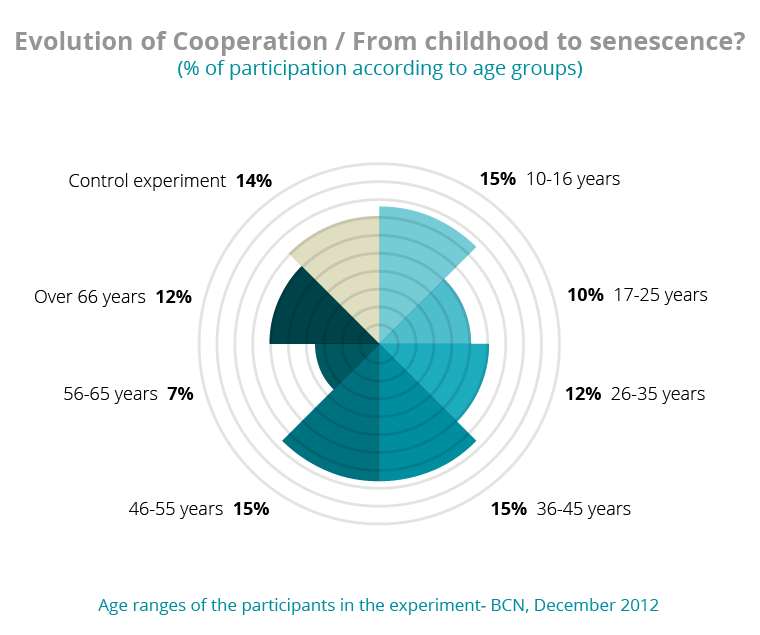 The experiment was held at the Fair of Board Games in Barcelona (December- 2012) and the main objective was to investigate how cooperation evolves across different stages of life and whether there is a transition in cooperativeness from childhood to adulthood and senescence. A total of 168 volunteers of different age ranges were involved in the experiment. The third experiment was held at the University Carlos III in Madrid and was attended by more than 200 university students of the same institution divided into groups of up to 25 people. This time, the main purpose was to elucidate whether cooperation is enhanced when individuals are allowed to form and break ties, simulating in this way the formation and evolution of social networks. As a conclusion, this website is mainly devoted to providing information about our work on evolutionary game theory and its applications to several fields, including the design and running of joint experiments -COSNET Lab/BIFI- UC3M- on human strategic behavior.